wavespeech is a joint exhibition by Edmund de Waal and David Ward, including a major new collaborative work and a group of new individually made and inter-related works by each artist. 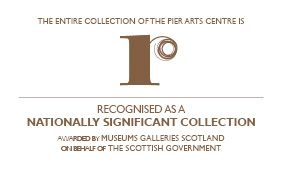 All are made especially for the unique galleries of the Pier and the context, seascape and landscape of the Orkney Islands. The artists are also making a new re-hang of selected works from Margaret Gardiner’s founding collection at the Pier. The project is curated by Michael Tooby in collaboration with the Pier Arts Centre.